Whoowee! I have had a really busy couple weeks, and this is the reason: 8 bridesmaids, 5 dresses, 3 skirts, 24 yards of fabric, and only 1 little me! I felt a weight lift off my shoulders yesterday as I handed the packaged order to the postal worker. For as much fun as I have doing some custom sewing, it sure can stress me out! The dresses were inspired by this J.Crew dress, but needed some adjustments. To stay within the bride’s budget, we decided to use polyester chiffon instead of the original silk. I made the sleeves slightly longer, and the neckline a bit higher. I also put the zipper in the back, rather than the side to make dressing easier. The result is a light, summery dress with a formal feel and a classic modest fit. I love it. I even ordered some material to make one for me in orangey-red. I can’t wait! 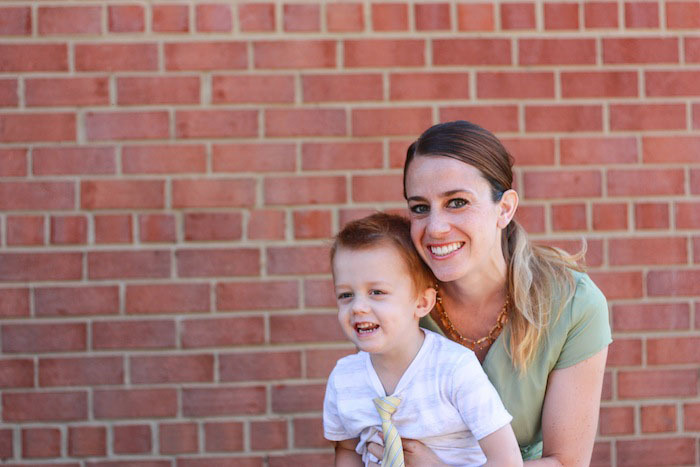 side note: Milo has to wear “a tie like daddy” almost every day. cutest. thing. ever. I had never made a cross-over top dress before. Well, unless you count this wrap dress, which I don’t, because it was a full wrap dress. and maternity. and made of knit. totally different. What I imagined to be the biggest challenge when adjusting/designing the pattern, was making the v-neck high and tight enough it wouldn’t need a pin to stay in place. I used McCall’s M6557 as a starting point for the bodices, then widened the shoulders to bring the v-neck up. Once I had it pieced on the dress form, I noted I also needed to add a couple inches of length to reach the natural waist, instead of empire. Finally, I added several inches of width to the corner of the cross over top, so I had sufficient chiffon to make a nice gathered bodice. I love the way it turned out, no pinning required. Here’s a little behind the scenes of the whole process. First, I assigned each bridesmaid a hanger with a little tag on it that had her name and measurements. That way I could keep them straight as I worked. Since the skirts are so gathered, I measured the same length of chiffon for all eight, and cut that first. 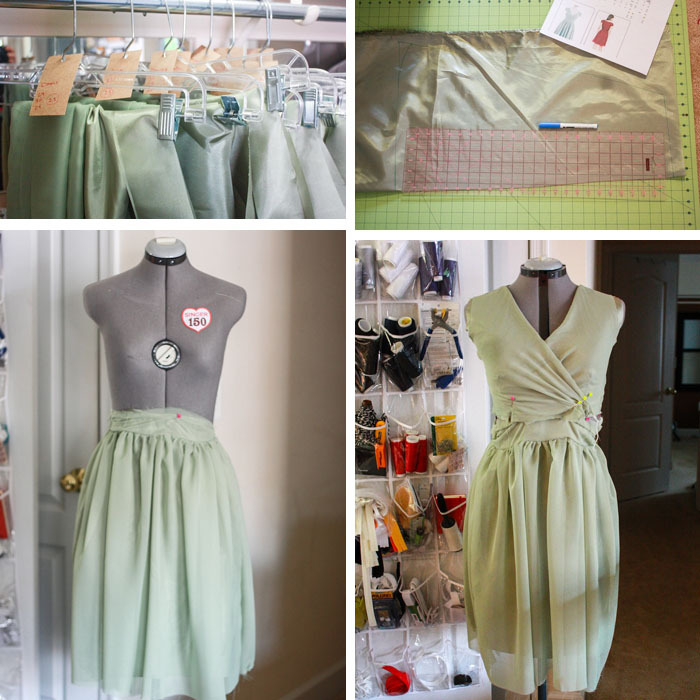 For the skirt linings, I made a basic A-line skirt using waist and hip measurements+ease+seam allowance. I might be a little reckless, but I drew these patterns right onto the fabric using this awesome Jacquard Auto Fade Pen. That allowed me to work more quickly than making a paper pattern for all eight dresses, and the pen ink disappears with a small amount of water. It’s like magic! Next I pieced and sewed each skirt. I then finished the three actual skirts by facing the waistband and hemming. Then I moved on to the bodices. I cut all five bodices to my pattern, which was made to the largest measurements. 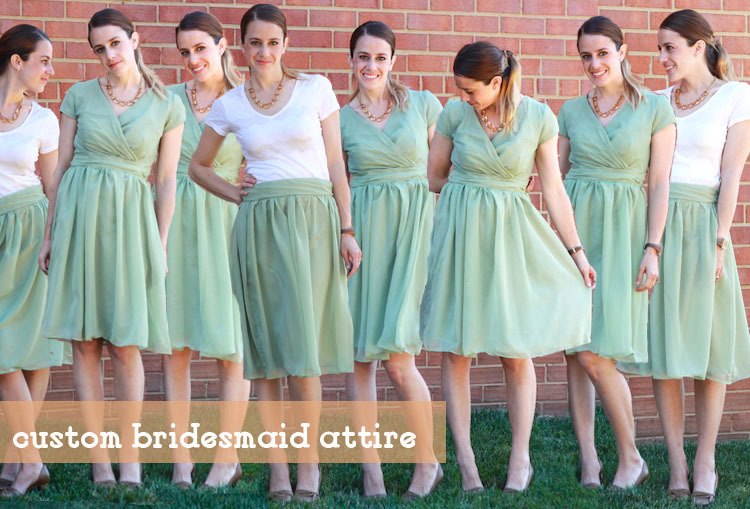 Then I tailored each of them to size by adjusting the dress form for each individual bridesmaid. The sizes only varied from a 0 to about a 4, so they were all in the same ballpark. I used spray adhesive to temporarily tack the chiffon to the lining, which worked out brilliantly, then pieced the bodice, adjusted darts, draped the chiffon, attached bodice to skirt, added sleeves, put in the zipper, and finally finished the sleeves and skirt with rolled hems. 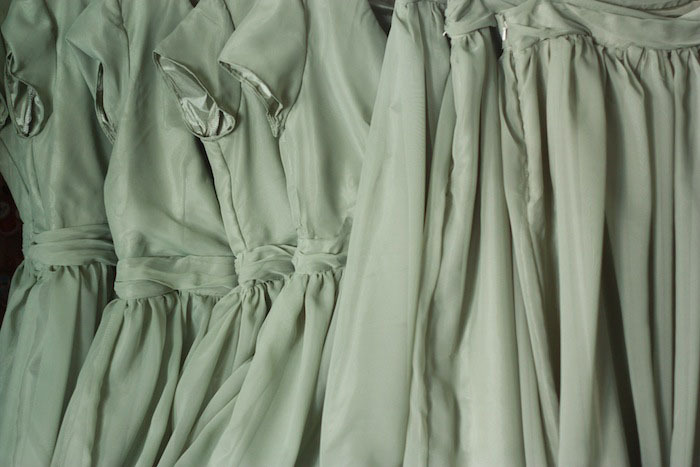 Then repeated the process until all five dresses were finished. After a final steaming and a once-over for stray threads, I wrapped up the attire and put it in the mail. One of the bridesmaids lives here in DC, so I get to deliver her skirt in person, and I can’t wait to see her in it. Often I miss out on seeing my projects reach their owners, so this will be awesome. I finished this order just in time to spend four hours on Saturday sewing costumes for a big youth celebration at my church. Nice break, eh?! 😉 I also got a chance to pull off a little Ikea hack I’ve been wanting to do for a while. I told myself I couldn’t start until I finished the bridesmaid attire. It turned out rad. Post forthcoming. Over the weekend the boys and I also had lots of fun at Dave’s firm picnic. Milo ate 2 sticks of cotton candy and about 4 ice cream cones, before getting his face painted like a lion, roaring a few times, then smearing the paint all over…good times. I loved working on this big bridesmaid project, and think I would do something like it again…I would probably allow myself a lot more time, though. I’ve got a few more orders to finish up in June, then planned a nice big break in July and August to catch up with myself. I’m hoping to spend lots of time at the pool with the boys, and we’ll be spending two weeks in Utah with our family. I know I am a total busybody. I have to be very intentional about planning down time or else my mind sort of auto-fills it with projects. Friends joke with me about not being able to “do nothing” and it’s sort of true. I totally fold the laundry while watching movies, and unload the dishwasher while chatting with Dave about his day. I am trying to find a balance that works for me. What works for you? How do you find or make time to complete projects while still enjoying time to just be? Is that even possible?